Most visitors to Spain include Madrid on their itinerary, but the colorful national capital isn't all that the country's most central region has to offer. 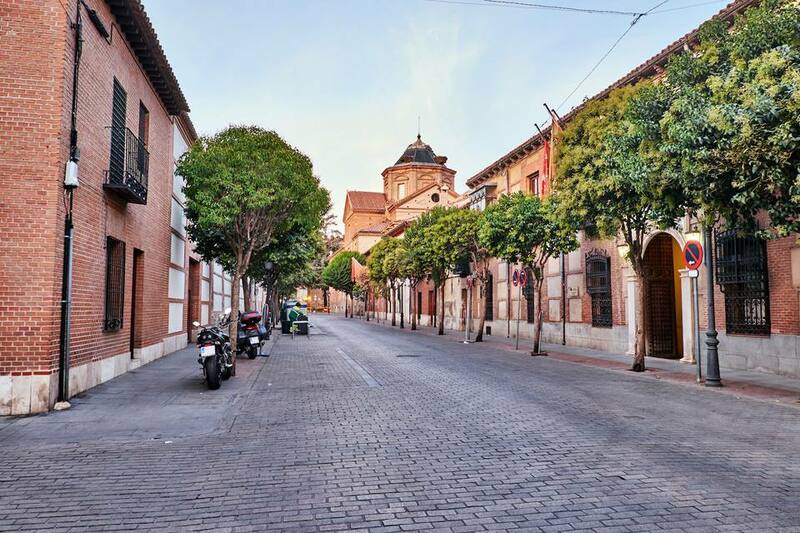 Just about 20 miles east of the city lies Alcalá de Henares, an idyllic gem of a town with centuries of history around every picturesque corner. While most people who visit Alcalá de Henares do so as a day trip, there's plenty to see and do in the city of Cervantes that will have you hooked almost instantly. Even if you haven't read "Don Quixote," the name likely rings a bell. Its author, Miguel de Cervantes, is considered one of the greatest literary minds in the Spanish language. He was born in Alcalá de Henares on September 29, 1547, in a modest home that still survives today as a museum. The historic two-story house has been restored several times over the centuries. However, it has been set up to look much the same as it did when the Cervantes family lived there in the 16th century. Visiting will immediately transport you back in time as you make your way through the carefully preserved rooms, learning more about the iconic author and his life along the way. In addition to its unrivaled historic value, the museum also hosts regular cultural events for visitors of all ages. From workshops for children and teens, to theater performances, thematic guided tours and so much more, there's always something going on. Check out the museum website for a full schedule of events. Europe is full of stunning churches, and to the untrained eye, many may start to look the same after a while. However, the Magisterial Cathedral in Alcalá de Henares absolutely merits a visit, both for its historic value and its unrivaled beauty. Dating back to the 15th and 16th centuries, the cathedral was built in honor of Justo and Pastor, two children who were martyred on the site centuries before. Its Gothic architecture and stunning details will take your breath away from the moment you step inside, but the beautiful views aren't just limited to the interior of the cathedral itself. Be sure to climb to the top of the cathedral tower to enjoy sweeping panoramic views of Alcalá de Henares from up above. No, you won't be able to register for classes if you're just in town visiting for a short period of time. However, the University of Alcalá is one of Spain's most storied. At the time of its founding in 1499, it doubled the size of the city and transformed it into a verifiable Renaissance center of culture and education. The main university building, the Colegio de San Ildefonso, is a quintessential representation of Spanish Renaissance architecture. For a 4.5 euro entrance fee, you'll get a firsthand look at one of Spain's oldest and most prestigious institutions of higher education, whose story is so interwoven with that of Alcalá de Henares itself that to visit the city without checking out the campus would be practically unthinkable. After spending a few hours wandering around museums and churches, you'll probably be craving some fresh air. Head to Cervantes Square, Alcalá de Henares's most picturesque plaza, to bask in history and get a glimpse into the everyday lives of the city's modern inhabitants. Plaza de Cervantes as a public square dates back to a time before the now-legendary writer was even born. In medieval days, the space was used as everything from a bustling outdoor market to a bullring. Today, it serves as a meeting point for residents of Alcalá de Henares, with a central location that gives easy access to the rest of the city. Location: Plaza de Cervantes is directly west of the university campus and Plaza San Diego. Back in the day, tapas came free with every drink you ordered in every city in Spain. Unfortunately, this practice is dying out in many places, and now you'll usually have to pay for both the drink and the tapa. Not in Alcalá de Henares, though. As one of the few Spanish cities that has preserved the free tapas custom, it's a fabulous place to go bar-hopping and try a few different shared plates at each place. And if you're thinking of tapas as being generally small, think again — portions in Alcalá are generous, so you're sure to be full after a few rounds. Dig into cozy, homestyle tapas at Las Cuadras de Rocinante, a rustic pub set in an unassuming, blink-and-you'll-miss-it locale on Calle Carmen Calzado. For a more international variety of tapas, try the fusion-style options at El Quinto Tapón. Ready to travel back thousands of years into the past? The Regional Archaeological Museum can help. This fascinating museum provides a look back at the history of the Community of Madrid (the geographic region where Alcalá de Henares is located, not to be confused with Spain's capital city) throughout the millennia. Set in a gorgeous 17th-century convent, the museum is worth a visit just for the building alone. Step inside, however, and you'll be greeted with a wealth of priceless objects and displays documenting how different civilizations lived in the local area throughout history. From prehistoric days to the Roman occupation to the Moorish period and the subsequent medieval Christian reconquest, you'll experience thousands of years of history all under one roof. Many cities and towns in Spain have a Calle Mayor (which literally translates to "Main Street"), but none quite like that of Alcalá de Henares. It's not just one of the city's most picturesque streets—it's the center of urban life, with locals going about their daily routine and visitors pausing to marvel at its spectacular architecture. Built on the ruins of an ancient Roman road in the 12th century, it originally marked the commercial center of the city's old Jewish quarter. It's been Alcala's most important street nearly ever since, connecting the cathedral square with Plaza de Cervantes. Do some shopping or simply enjoy a relaxing stroll along with some people-watching. Want to visit the Alhambra, but can't make it to Granada this time around? Or is marveling at Pompeiian frescoes more your speed? No matter which architectural style and historical period fascinates you, you'll find it all at Laredo Palace. Despite its otherworldly appearance, the palace is relatively new, dating back to 1882. The different areas inside encompass the most important eras of Spanish history and European architecture, drawing inspiration from the Roman period, Moorish days, Gothic and Modernist styles and so much more. It's an architecture lover's dream come true, and easily one of the most fascinating buildings in Alcalá de Henares. The palace also houses a museum dedicated to Cardenal Cisneros, the founder of the University of Alcalá. Many visitors to Alcalá are aware of the city's rich Renaissance heritage, thanks in part to its association with Cervantes as well as the university. However, the city's history dates back thousands of years further. At the beginning of the first century A.D., the city that is now Alcalá de Henares was home to a thriving Roman settlement known as Complutum. In its heyday, Complutum was one of Roman Iberia's most privileged cities due to its strategic location along one of the main roads. Today, the center of the old city survives, consisting of a Roman forum, a handful of private homes, a few streets and the old sewer system. The main entrance to Complutum is located at the southwestern corner of Alcalá de Henares along Camino de Juncal. After walking around exploring the city all day, you'll probably have worked up quite an appetite. Luckily, the foodie fun in Alcalá de Henares doesn't just stop with the enormous free tapas. The city is also home to some of the most delicious pastries in Spain. When it comes time for merienda (the mid-afternoon snack enjoyed throughout Spain), go ahead and treat yourself. Try the famous rosquillas de Alcalá—a local favorite similar to a light, juicy glazed donut—at Pastelería Lupe (Calle Sebastián de la Plaza, 2). This iconic bakery is said to be the favorite of the queen of Spain herself. Another excellent option is the costrada—layers of flaky puff pastry and meringue whipped to perfection—at Salinas Bakery in Plaza de Cervantes. What Can You Do With Less Than a Full Day in Cadiz?